The process is not linear (as indicated in the diagram). It is iterative and parallel. The diagram just depicts the various tasks/steps of the entire process. 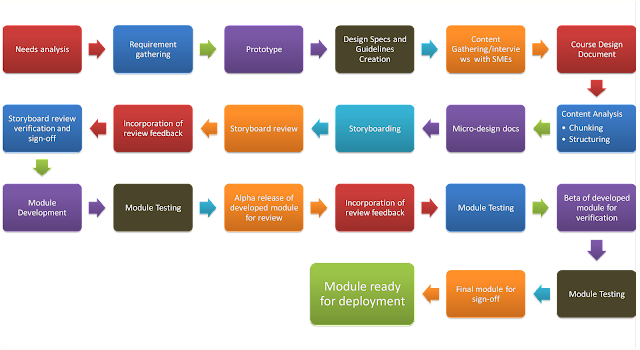 These were the key points the client needed to understand to get a feel of what happens behind the scene in elearning development. Read the post for a more detailed explanation. Projects are how we change the world and introduce new knowledge into our organizations (when they are done well that is - also sometime how we remove obsolete knowledge and processes). Though the post is on Knowledge Management--and a tiny gem of a post it is--it was this comment that drew my attention because of a recently completed project. While I can't say this project changed the world, but it definitely changed me (because of all I learned and learning is change) and added a world of altogether different perspectives. I have tried to capture some of my key learning in this post. But before I fast forward to the learning, here's a brief overview and background to set what I learned in context. I have erred on the side of caution and have not named the client. The client (an IT organization functioning in the telecom industry) has a global presence with footprints in all the continents, and the major countries within each. They have very very well-defined training programs with certifications in place. It is mandatory for all technicians in the organization to take the training/be certified before they are allowed to venture on to client sites. I went as the Consultant to do the initial requirements gathering and scope analysis. The C-suite folks wanted e-learning. They had a some notion of what it entailed having observed other organization. The management below that had no clue what "moving to e-learning" meant. I could not do requirement gathering or scope analysis without educating the client on e-learning, its various phases, the implications, the role of SMEs, trainers, learners, etc. I had to get the buy-in from the people I would be interacting with daily to develop and design the course and convince them that e-learning wasn't so evil. I kept aside all thought of scope analysis and content gathering. I spent the next few weeks focusing on preparing and giving presentations with the hope of explaining e-learning to folks with hell of a lot more experience in the corporate world than I have. Aside: Point #1 is ratified by a point made by Jenise Cook in her post, How to Estimate Training Time and Costs. One e-learning consultant in another state told me his “secret”. When he gets a brand new client, he does not work on a fixed, project fee basis, he always works on an hourly basis. When a new client is new to e-learning, he finds he’s also a coach as well as an ID and a developer, and the coaching takes up more of his time. It is important to keep this pointer in mind if you are introducing elearning. It saves the client and the project team some anxiety about time and cost. As I spent almost a month explaining the various concepts and terminology related to e-learning, the differences and similarities between e-learning and ILT, the advantages of each, I could see the mindset changing palpably. Trainer: "Oh, we need your input on the CDD because you have to verify if the performance objectives noted against each topic maps to what that topic is supposed to cover." What do you mean by gathering content? What are the various things you do before we can see an elearning module? How long does it take to review a storyboard? Will you show us how to review one? How do you "fit" the content into a storyboard? What do you mean by a module and its objectives? Our learners are new to elearning? How will they adapt to the navigation? Can you explain the different UI features and the functions in the prototype you showed us? Can you build a feature where they can ask questions if they get stuck? If we want them to go the main document for reference, can we add the document to the module? Post this phase, the regular activities of gathering content, analyzing it, creating micro-design documents and writing storyboards started. Moving ahead to the review of the storyboard phase. This was when I truly felt the impact of having introduced elearning as a concept to the client first. The trainers and SMEs not only felt involved, but they were also convinced of the value of the tasks they were performing. This made a huge difference to the way they reviewed, to our interactions, and to the experience of the entire development phase. Yes, this project did make a difference. A huge difference to me!